Sauron, the Dark Lord, has gathered to him all the Rings of Power – the means by which he intends to rule Middle-earth. All he lacks in his plans for dominion is the One Ring – the ring that rules them all – which has fallen into the hands of the hobbit, Bilbo Baggins. In a sleepy village in the Shire, young Frodo Baggins finds himself faced with an immense task, as his elderly cousin Bilbo entrusts the Ring to his care. 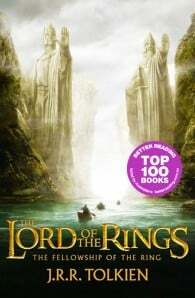 Frodo must leave his home and make a perilous journey across Middle-earth to the Cracks of Doom, there to destroy the Ring and foil the Dark Lord in his evil purpose. John Ronald Reuel Tolkien (1892-1973) was a major scholar of the English language, specialising in Old and Middle English. Twice Professor of Anglo-Saxon (Old English) at the University of Oxford, he also wrote a number of stories, including most famously The Hobbit (1937) and The Lord of the Rings (1954-1955), which are set in a pre-historic era in an invented version of the world which he called by the Middle English name of Middle-earth.